Some of our favourite craft companies are based across the pond in America. We caught up with the fabulous Becky Higgins, creator of Project Life, to find out more about her genius creations and what inspires her. 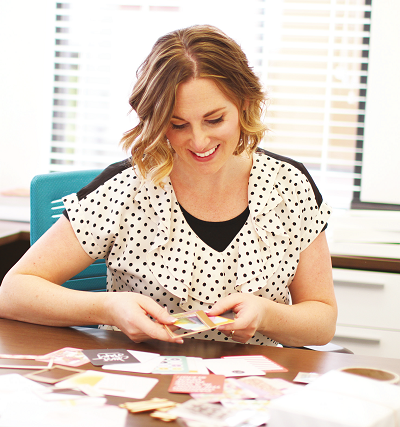 You’ll have a hankering for a week-long craft session when you’re done, that’s for sure! Where did the idea for Project Life come from? The concept was born out of my own frustration. I’ve been a lifelong scrapbooker and have spent countless hours creating hundreds upon hundreds of pages to document my family’s memories. As much as I value creative time, I reached a point several years ago where it all just felt like too much. Too much time. Too much effort. Too many supplies. There wasn’t a single part of me that wanted to throw in the towel but I felt so strongly that if I were going to continue preserving memories, there had to be a simpler approach. I searched for an easier way but just couldn’t find anything to satisfy my need. So I created the solution for myself. That’s how Project Life was born. 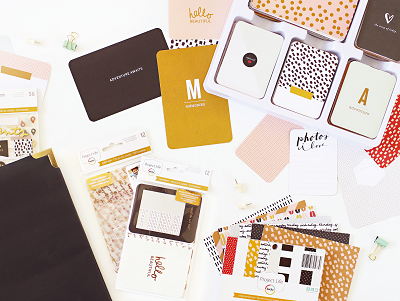 What is it that you love most about scrapbooking? The end result of having a completed scrapbook is great; there’s no doubt about that. But scrapbooking as an experience… now that’s something special. I love that the act of bringing memories together makes me that much more aware of how blessed I am. Going through that process makes us more likely to appreciate life, with all its ups and down. This, in turn, motivates us to want to continue to cultivate a good life. What’s not to love about that? That’s like choosing a favourite child. Impossible! But I will say that I’m very much drawn to anything Liz Tamanaha designs. The Midnight Edition and the more recent Everyday Edition, for example. Liz has a minimalist aesthetic and I’m drawn to that because of personal taste, but also because minimalist design allows the focus to stay on what’s most important – the photos. Not too long ago I had this moment that was utterly amazing, and I felt it from head to toe. The office was full and things were buzzing with lots of productivity, meetings, conversations and brainstorming. Everyone was doing what they do. I was walking from our conference room to my office and the most overwhelming feeling came over me that we created this. My staff are devoted, loyal, hard-working, trustworthy, stellar individuals in so many ways. And somehow they chose to work for our company. The feeling wasn’t so much pride as it was humility. Sometimes I just can’t believe that this is something my husband and I have been able to create together. Has there been a scrapbook that’s particularly inspired you? Oh yes. A couple of years ago I was on tour in Australia, visiting many cities and meeting my customers. On the last stop, the ladies who were all part of the Project Life Australia Facebook group presented me with an album, paying tribute to me with each of them expressing what Project Life meant to them. I was absolutely brought to tears. What can I do with all the Christmas cards I receive, as I don’t want to throw them away? Becky says… Visual reminders of our family and friends are treasures for sure, so I don’t blame you for not wanting to throw those away! First of all, consider punching a hole in the top corner of each card and connect them all with a ring. 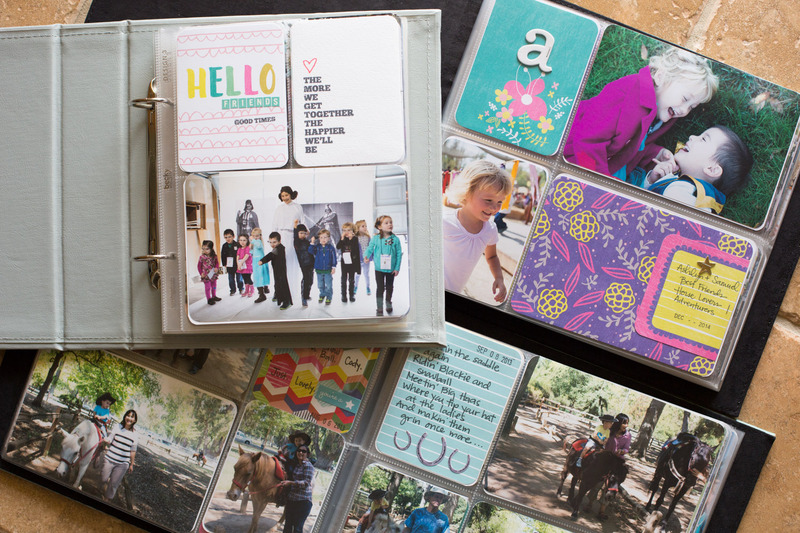 Another recommendation is to use Project Life® Photo Pocket Pages and get all of your favourites in a scrapbook. When I do this, they become a part of our family album, not necessarily an album full of Christmas cards. I need to make a last-minute scrapbook as a present, but it can’t be too complicated, where do I begin? Becky says… Making a scrapbook or photo book can be the greatest and most meaningful gift to give or receive! But it doesn’t have to be a huge project, my best advice is to keep it small. Begin with the end in mind and having a clear idea of what you’ll be pulling together for the recipient – you will have great success if you keep the project to a manageable size. Project Life Mini Albums are an excellent place to start because the pages are already stitched in. Just add some 4” x 6” photos and Project Life cards and that’s it – no cutting or glueing required. Is there anything exciting on the horizon? The future is bright. Our customers are what drive us to continue to do better all the time. Our philosophy remains in tact, and that is to help people cultivate a good life and record it. Want to get involved? Head to beckyhiggins.com to find out more!